Ya, I know, not much a surprise. Reality really isn’t one of their strong points, so they don’t respond to the same stimuli as sane people. One common trait amount so called “progressives” is that nothing is ever their fault. For example, I saw a moonbat on Facebook arguing that it was the Republicans who were trying to kill the US Post Service. The USPS is in dire financial straits because the majority of their employees are members of a public service union and they are supposed to operate as a P&L. Those two are mutually exclusive! Here is a news flash, it wasn’t the Republicans, or even moderate democrats who inflicted public service unions on the American tax payer. Hell, even FDR, the uber-progressive, said they were a bad idea. Will any leftist admit that the USPS is royally screwed because their policies have inflicted ruin? Of course not! They can never admit fault! So it must be the fault of the “evil Republicans” for not wanting to flush more tax payer dollars down the toilet created by leftist “progressive” policies. Yet another example of the “tolerant and opened minded liberal” going hyper-partisan at Warp Speed. The only thing going for the Republicans in these attack is that there isn’t a clear Republican leader they can go all Alinsky on. Nobody to destroy personally in order to get their base of low information voters all lathered up in a series of two minute hates. They need their Emmanuel Goldstein. They have tried their racist attacks on Rubio and Cruz because they fear popular conservatives with a minority background. So they want to punish them for straying off the plantation. So far, the left’s pathetic attempts have resulted in a major fund raiser for Rubio. It’s back to Mega-City One and the world of Judge Dredd. This time it’s with SciFi fan Karl Urban in the lead role instead of Stalone. Urban played this role much truer to form. As in the Comics, you never see Dredd’s face. He always wears the helmet. It’s gritty, dark, nasty, and a lot of fun to watch. The bad guys are bad, the good guys are damn harsh, but fair. In all, a fun ride for fans of gritty SciFi action films. I’m seeing a lot of Philip Jose Farmer’s work come back into print, which is a good thing. The Mad Goblin is one of two parallel sequels to A Feast Unknown. This one focuses on James “Doc” Caliban (yes, based on Doc Savage), half brother of the fellow Tarzan was based on. Both are former agents of “The Nine.” A group that discovered the secret to extremely prolonged life thirty thousand years ago and has ruled the Earth from behind the scenes since then. This is adventure pulp at its finest, with Farmer paying tribute to one of his favorite fictional characters. Let us once again refer the the chart our Dear Leader‘s economic team used to scare people into buying into the miserable failure of a porkulus package the democrats rammed down the throat of America back in 2009. Oh, but with reality also displayed. So, using the Obama regime’s own metrics, the so-called “economic policy” has made things worse for average Americans than doing nothing would have done! 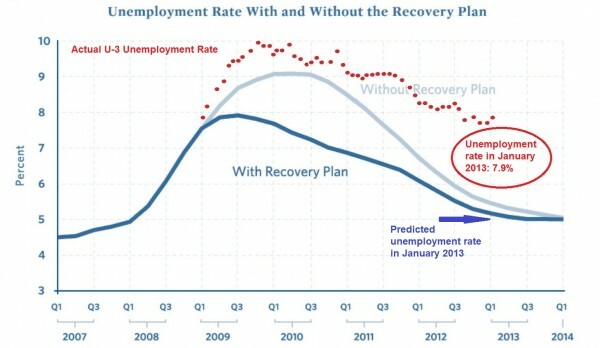 They predicted an unemployment rate of 5.5% by now if nothing was done and 5.1% if the administration got to print more money and give it to democrat campaign donors. The only reason the current U3 unemployment rate is is as low as 7.9% is that over eight million people have been removed from the labor pool that the feds use to calculate the employment rate. That includes everyone in the obscenely high long term unemployment pool that have run out of the extended unemployment benefits. The U6 rate, which includes the underemployed is still at 14.4%, which appears to be the “new normal” in Obama’s progressive dream of America. James Pethokoukis points out that our Dear Leader‘s economic team made other really bad predictions. In case you haven’t heard, GDP for the fourth quarter of 2012 came in at -0.1. That’s right, after three and half years of the worst recovery since the Great Depression, the US has slipped back into negative GDP growth under the stewardship of our Dear Leader. We actually could be in another recession, but we won’t know for another three months. Until then, we’re in a Schrödinger’s cat situation of recovery/recession. Given that our Dear Leader and his democrat minions are calling for more taxes, more government spending (with $0.46 on the dollar borrowed) and more business hindering regulations, it’s looking more like that cat is a recession. A nice SciFi action flick starring Bruce Willis, Joseph Gordon-Levitt, Emily Blunt (actually not in a RomCom!) and nicely played role by Jeff Daniels (“Kid, I’m from the future. Trust me, go to China.”) Some folks found the time looping a little hard to follow, but it wasn’t too difficult for those of us who have been watching Doctor Who for the better part of 30 years. For the most part, the acting really helped this flick shine. The story itself was interesting, and it was fun to watch the characters grow when presented with both their past and their future. Definitely worth a rental and popcorn.